Over the last two decades drifting buoys have become the most prevalent in situ measurement method for sea surface temperature(SST). Drifting buoy data are particularly popular because of their high spatial and temporal coverage. Their freedom of movement allows them to provide data offside shipping routes and moorings and the high temporal resolution gives insight not only into seasonal but also diurnal variations of SSTs, as shown in Morak-Bozzo et al, 2015. Drifting buoy observations need to be verified before they can be used for quantitative studies involving SST data and cleaned from artefacts linked to erroneous observations or faulty instruments. The main archive of drifting buoy observations is the International Comprehensive Ocean Atmosphere Data Set (ICOADS). In our current project we investigate the life story of approximately 26000 buoys from 1979 to 2014, from the time of their deployment to their “death”. We also observe and document how the network of drifters evolves over time and we assess the quality of the data. Figure 1: For the subperiod 1982-2012 and a total of 22678 buoys, the position of deployment is shown on the left and the position of their last signal on the right, gridded on a 2-by-2 degree grid. 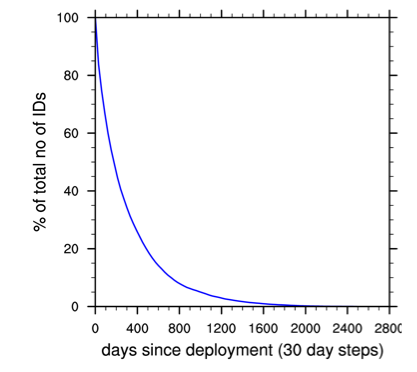 Figure 2: This figure is showing the distribution of the buoy lifetime for all the buoys in the ICOADS archive. We can see that less than 40% of the buoys make it past the first year after deployment and less than 20% survives more than two years. 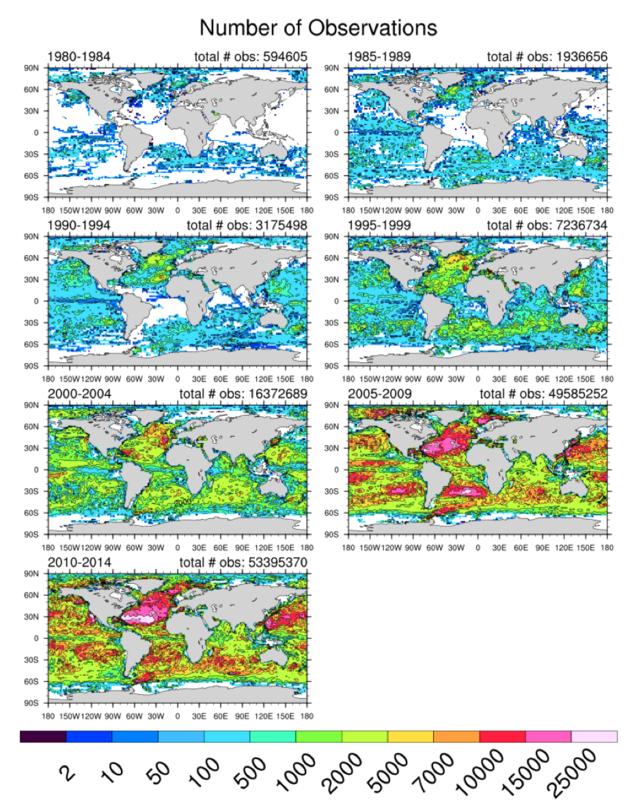 Figure 3: The maps are showing the cumulative number of drifting buoy observations in each 2-by-2 degree box for seven 5-year periods (1980-1984, 1985-1989, etc.). In the top right corner of each subfigure we show the sum of all observations in that 5-year period. The majority of buoys reports at least every 3 hours, if not hourly. An important step to determine the reliability of the data is the creation of an automated protocol for quality control (QC) to complement the limited QC product provided by ICOADS. The set of algorithms we developed can detect e.g. stranded and misplaced buoys or non-plausible SST reports. Compared to an independent data set of SSTs, such as Reynolds AVHRR-only (Reynolds et al. 2007, Banzon et al. 2016) the ensemble of QC flags shows a clear improvement of the quality of the drifting buoy data set. The resulting data and associated uncertainty will be contributing to a new SST reconstruction dating back to 1850, under the project HOSTACE (Historical Ocean Surface Temperatures: Accuracy, Characterisation and Evaluation). Morak-­Bozzo, S., Merchant, C. J., Kent, E. C., Berry, D. I. and Carella, G. ,2016:Climatological diurnal variability in sea surface temperature characterized from drifting buoy data. Geoscience Data Journal, 3 (1), 20­-28, doi: https://doi.org/10.1002/gdj3.35. Banzon, V., Smith, T. M., Chin, T. M., Liu, C., and Hankins, W., 2016: A long-term record of blended satellite and in situ sea-surface temperature for climate monitoring, modeling and environmental studies. Earth Syst. Sci. Data, 8, 165–176, doi:10.5194/essd-8-165-2016. Reynolds, R. W., T. M. Smith, C. Liu, D. B. Chelton, K. S. Casey, and M. G. Schlax, 2007: Daily high-resolution-blended analyses for sea surface temperature. Journal of Climate, 20, 5473–5496, doi:10.1175/JCLI-D-14-00293.1. This entry was posted in Climate, Climate change, Data collection, Data processing, earth observation, Measurements and instrumentation. Bookmark the permalink.